Weighted graph matching is a good way to align a pair of shapes represented by a set of descriptive local features; the set of correspondences produced by the minimum cost matching between two shapes' features often reveals how similar the shapes are. However, due to the complexity of computing the exact minimum cost matching, previous algorithms could only run efficiently when using a limited number of features per shape, and could not scale to perform retrievals from large databases. We present a contour matching algorithm that quickly computes the minimum weight matching between sets of descriptive local features using a recently introduced low-distortion embedding of the Earth Mover's Distance (EMD) into a normed space. Given a novel embedded contour, the nearest neighbors in a database of embedded contours are retrieved in sublinear time via approximate nearest neighbors search with Locality-Sensitive Hashing (LSH). 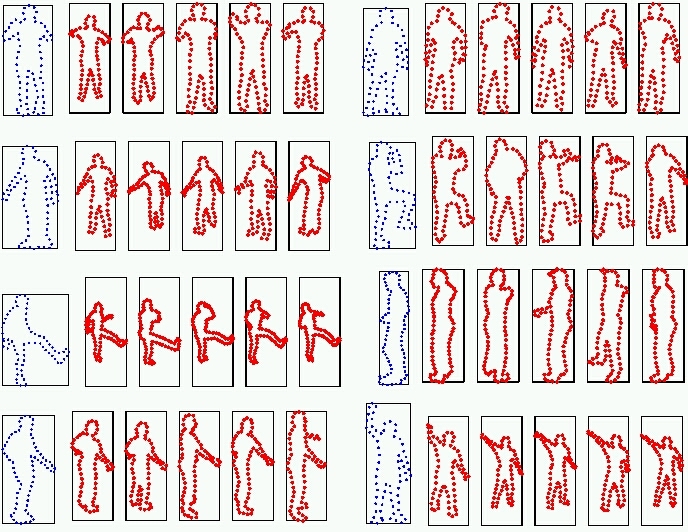 We demonstrate our shape matching method on a database of 136,500 images of human figures. Our method achieves a speedup of four orders of magnitude over the exact method, at the cost of only a 4% reduction in accuracy. The minimum cost of matching features from one shape to the features of another often reveals how similar the two shapes are. The cost of matching two features may be defined as how dissimilar they are in spatial location, appearance, curvature, or orientation; the minimal weight matching is the correspondence field between the two sets of features that requires the least summed cost. A number of successful shape matching algorithms and distance measures require the computation of minimal cost correspondences between sets of features on two shapes. Unfortunately, computing the optimal matching for a single shape comparison has a complexity that is superpolynomial in the number of features. The complexity is of course magnified when one wishes to search for similar shapes (``neighbors'') in a large database: a linear scan of the database would require computing a comparison of superpolynomial complexity for each database member against the query shape. Hierarchical search methods, pruning, or the triangle inequality may be employed, yet query times are still linear in the worst case, and individual comparisons maintain their high complexity regardless. 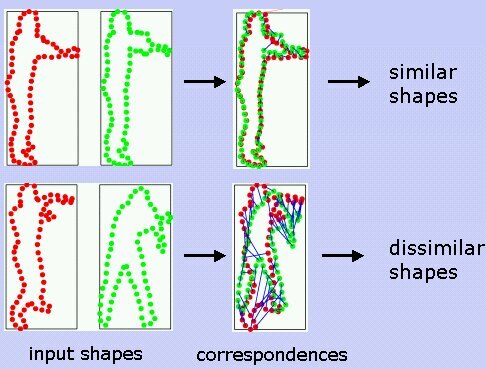 To address the computational complexity of current correspondence-based shape matching algorithms, we propose a contour matching algorithm that incorporates these approximation techniques and enables fast shape-based similarity retrieval from large databases. We embed the minimum weight matching of contour features into L1 via the EMD embedding of [Indyk & Thaper 2003], and then employ sublinear time approximate NN search to retrieve the shapes that are most similar to a novel query. The embedding step alone reduces the complexity of computing a low-cost correspondence field between two shapes from superpolynomial in the number of features to O(nd log(V))), where n is the number of features, d is their dimension, and V is the diameter of the feature space. In this work we also introduce the idea of a low-dimensional rich shape descriptor manifold. Using many examples of high-dimensional local features taken from shapes in an image database, we construct a subspace that captures much of the descriptive power of the rich features, yet allows us to represent them compactly. We build such a subspace over the ``shape context'' feature of [Belongie et al 2002], which consists of local histograms of edge points, and successfully use it within the proposed approximate EMD shape matching method. according to its histogram’s 2D PCA coefficient values. Similarly colored points have low matching cost. We have demonstrated our fast contour matching method on datasets of 136,500 human figure images (real and synthetic examples). We report on the relative complexities (query time and space requirements) of approximate versus exact EMD for shape matching. In addition, we study empirically how much retrieval quality for our approximate method differs from its exact-solution counterpart (optimal graph matching); matching quality is quantified based on performance as a k-NN classifier for 3-D pose. Below are some example database retrievals found with our contour matching method. Examples of database retrievals using our contour matching method for real image queries. Database is composed of 133,000 shapes of humans in random poses taken from synthetic images. Query shapes (blue, left in each example) are extracted from the silhouette from real images. Five NN are shown here for each query. The representation that is used here is the shape context subspace feature.